“Sure you do,” I shot back. *snort* Endearing and goofy and just plain awesome! I LOVED IT! Wonderfully written with purpose, we never lose track of the initial focus. Of where we just KNOW we are going. Or where we *think* we are going. The author keeps us guessing as she weaves us from past to present. And best of all? She takes her time as she presents to us, a complete story that will have you crying happy tears. And sad tears. I hurt in every possible way a body could hurt. I hurt from my skin to my soul. And it gave so many of us (not just me 😛 ;)) the sniffles! Okay fine. The ugly cries, too. Maryse: I’M LOVING LOVING LOVING The Mason List my friends. LOVE! Has a bit of The Sweetgum Tree feel but more modern I’d say. Amy: Sweetgum Tree feel??? *claps hands* Now it’s definitely a late reading night for me!! MichelleS: Maryse – you are loving Mason List with all capitals? And It’s go that Sweet Gum tree feel? SOLD! Sounds like the perfect weekend read! Victoria: Ahhh!! I was just about to suggest this to you! I just finished reading it at 6am this morning (hardly slept a wink!) and couldn’t stop bawling! I still cry even now whenever I thumb through the pages again. It’s such a tear jerker! I absolutely loved Jess and Alex! I have never been moved so strongly by a book before! Seriously guys, get the tissues ready and maybe have some ice cream at hand. I can’t even start another book yet because I’m still emotionally recovering from this one! Amy: I’m a-freaking out here. Heart is racing (and aching! ), tummy is clenching, skin is splotching…you name it, it’s happening to me. I’m loving this ride but I think it’s gonna hurt. Badly. But I almost hope I’m wrong. *Almost*. ‘Cause you know I like to hurt…in books, always and only in books. That last line of the chapter way back at 27%…did you get an *oomph* there? Like a that-was-a-significant-line kind of *oomph*? Or maybe I’m just too wound up and letting my mind run rampant right now. Probably. I hope so. Or I *think* I hope so. Arrrrrgh!! See?!?!? Told ya I was a-freaking out! Cheryl: Maryse The Mason List has a “Sweetgum feel!!! !” That just might be my next read!! Amy: It’s been a balls-to-the-wall freak out for me so far…and I don’t think I’m to the hardest part yet! Laura has the manatee right now but she’s on notice that she’ll have to share him soon. I *think* I know something that is going on from some subtle hints being dropped. Very subtle hints. With the way the “present” story is going…oh man, this is gonna be rough. And I love it. MichelleS: I got to about 40% last night. It’s got me 100% invested. It does have that Sweetgum Tree feel. I love it when I am right there in the simple moments – jumping in a lake, or climbing up into a tree house… with a sweet boy… total sap… that’s me. LOVING IT…… please don’t break my heart…. please don’t break my heart…..
Amy: Mar-y-y-y-y-se!!! Why you makin’ me go through this alone??? *huffs* Not happy with you. Kidding! You know I luffs ya! But seriously, not cool… Wow, how old am I again?? I’m gonna take my iPad and go hide in my blankie cave. I *have* to finish this book before my hubby gets home and starts laughing at me. Maryse: GAH!!!! I’m SO sorry Amy. I’m such a bad buddy-reader!!! *slaps hands!!!! * *sigh* Hug? And… Amy… ummmmm…. can I borrow your manatee? Camille: 52% through it and totally hooked. Melannie: Finished it and LOVED it! Chris: Im almost done. Loving it so far. MichelleS: I finished The Mason List. I am going with 4.5 stars…. I absolutely loved it, and stayed up way too late to finish it, because I couldn’t put it down… only thing keeping it from 5 stars, for me, was the ssssllllllooooowwwww build up. I mean excruciatingly slow! And at some point I start thinking that no way would it happen this way. Then after the achingly long wait…. BAM…. it’s over. And short epilogue. So that’s why the 4.5 stars for me. Amy: I agree about the end and epilogue being kinda quick, MichelleS. I didn’t mind the slow build-up (love that kind of “slow burn” as Maryse calls it) but once I got to about the 50% mark, holy sh!t it was a crazy intense ride for me! As if that’s not obvious from my comments on the other page, right? I absolutely loved this one. A girl’s journey (and personal and emotional struggle) from beautiful childhood memories, to devastating circumstances, to a charitable family taking them in. From her growth within that family, within their society, within her new home, and yet… so far from what she ever dreamed her life would be. Shame pumped through my body with each beat of my heart. I hated charity. I hated depending on others. I hated being homeless. I hated people knowing we had nothing. From a wonderful life with her loving mother and father, to her mother’s declining health as cancer ravages her body. Her father ends up losing his job due to staying at the hospital with his dying wife for so long (the love of his life), and they eventually end up living in their car. Eating moldy sandwiches. Living in filth, and yet still staying by her mother’s side with each set of visiting hours. They had nothing. They were losing everything. Even themselves. When did I stop being the child and become the rock for my father? I nodded in agreement. It completely sucked. At the time I should be getting a bedtime story, I was lying to my father, so he didn’t have another breakdown. From childhood, to teen years, to college years to adult years, each character comes alive. Their interactions to their reactions, to their personalities, flaws and all. I would pay them back; I just didn’t know when or how, I just knew it would happen. Someday I would repay every so-called miracle. I would not be a product of charity. Every character is distinguishable, real, “fleshed out” and perfectly believable. They can be awe-inspiring and genuine, self-centered and pouty, to typical-hateful and no-nonsense. Each one will surprise you in their own way. Good surprises… and bad surprises too. Two surprises involving side characters were especially marking, to me. One hurt me so badly, and one warmed my heart and I never saw it coming. Yep. If you love a “sweet” but weighty read that takes us through life lessons and growth to romance and all of it’s angst, then this one is for you. Kind of reminded me (in FEEL) of books such as The Sweet Gum Tree and Butterfly Weeds and even a touch of The Sea Of Tranquility (due to the incredible maturity displayed by even some of these younger characters. From their thought processes and how they dealt with certain life situations to the epic heartwarming and enlightening moments). Every emotion from dejected heartache and no hope to incredible hope. From resentment, to an undeniable bond, to incredible mistakes. A bit of hate, even. Of each other, and often of themselves. But mostly love. Tons and tons of love. After months of hurt, the rope holding us together was growing stronger. That’s what happens when something severs a tie. A new one has to be woven in place around the broken threads, making it bigger and tougher than what existed before the ripping pain. Deep, clever, heartfelt and loaded in wonderfulness! Maryse I must know if any of the main characters die. I decided today I am only reading HEA and I cannot have a main character die. I want to read this. Just tell me if I should read or if you think maybe I should pass, no more questions asked. Thank you so much for all you do. I have been a long time fan of your blog and is the only one I check religiously, twice a week and then check your facebook page. You do so much and I love your reviews, I trust your judgement, I do not think you can be bought, you are fair and I appreciate it. Thank you again and please let me know. I am finally reading My Skylar now and am loving it. And then you had to go and mention three wonderful, touching books (all of which I LOVED)… *sigh* Now I’m craving a beautifully emotional book! The Rosie Project? I loved that book! So funny. And since it was written by a guy, the male POV was very very strong! And hilarious! If you’re in the mood for a light, witty, well written off-beat romance, this is it. I’m loving him!!! He’s so discombobulated with Rosie. LOL!!!!! Rosie’s father-search kind of reminds me of the Southwark episode when Cartman was looking for his father, and the had a whole wild “party” of men to determine who might be the one. LOL! This is gonna be hilarious! I loved The Mason List. I finished it this morning while having a smoke on the wooden bench outside the office. It was amazing. I couldn’t wait to e-mail the author and gush over her beautiful book. (and I dont usually do that 🙂 ) I also read the sweet gum tree – I loved it too but The Mason List was for me a whole lot better. I have the biggest book hangover right now. 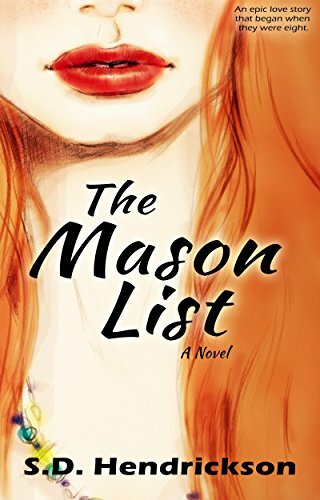 Finished The Mason List and it was a gut-wrenching emotional journey. I just felt wound-up and on edge waiting for whatever it was that happened to happen. I too loved the slow pace, but agree the ending and epilogue felt like a let-down after the slow, highly emotional build-up to it. Amy A Place to Call Home, cuddle away, lol. Ok, promise last time I mention that book. Rosie Project has been on my list for so long. I really have to start reading these books I have. MichelleS, have you read the sequel? Bev – there’s a sequel to Rosie Project? I had no idea! Someone tell me if it’s as good as the first one. I will be hiding out on my couch for the next few days: finish Murder of Crows, devour Burned, move on to more hot Fae in Fae Chronicles #4, then finally read the new Neighbor From Hell! Crazy book week for me. Ok finished last night. Loved the story BUT though it was a slow build hour by hour and year by year of their journey I thought the end was rushed and to not know the end until the EPILOGUE upset me. But like I said I did like the story but felt cheated at the end. Never…..A place to call home….who is the author, when I looked on amazon there is like 20 books with that title. In the mood for a good cuddle book!!! Patty, the author is Deborah Smith. If you try it I hope you like it. bev, Thanks I will definitely look it up, I’m in the mood for a good HEA.